Last week I was a bit off the grid. You may have noticed the lack of updates; that was because Mercedes and I attended the Overland Rallies and Workshops in Leavenworth, WA. 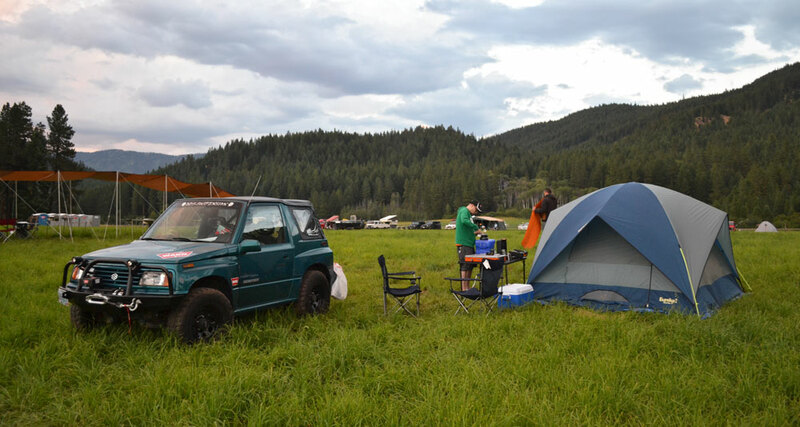 These rallies bring overlanders and vehicular travel enthusiasts together in one spot. There are classes ranging from cooking and travel practices, to field medical practices and vehicle recovery. In fact, I gave a class in basic winching using the one and only "Teal Terror" and my WARN VR8000-s winch. Mercedes and I left on Thursday morning a bit after 10:00am. The drive up to Leavenworth took us up the I-5 corridor by Seattle until we reached highway 2, which heads over to Leavenworth, where we camped for three nights at the rally site. Sunday, we headed to the Zillah, WA area to pick up a few bottles of wine from Cultura Wine, Portteus Winery, and Severino Cellars. Then it was down highway 97 where we connected up with I-84 and headed back into Portland. Total mileage? 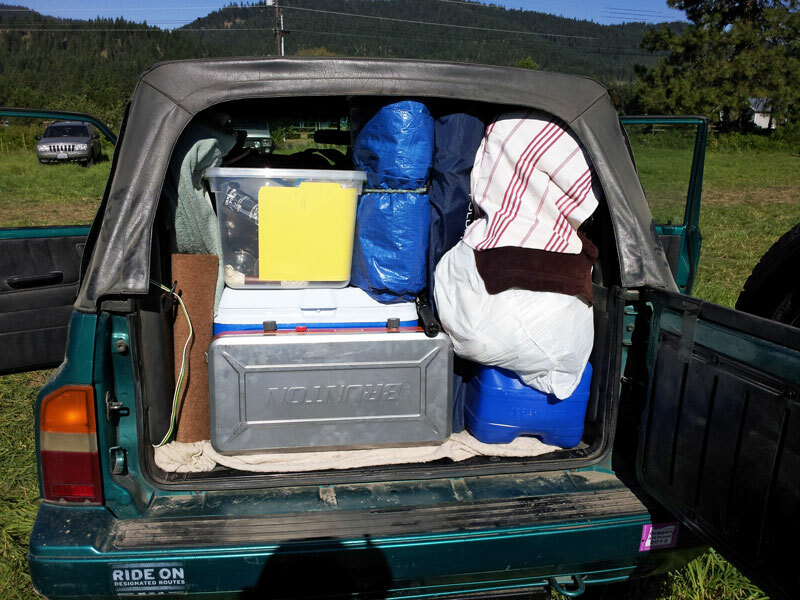 About 700, which makes this, by far, the longest trip the little Suzuki has been on since we've had it. Needless to say, packing for four days on the road, camping, and displaying product for my day job at Warn Industries took a bit of planning to ensure everything fit in the Sidekick. I had removed the back seat which helped greatly, and luckily, there's a good amount of room to stack stuff. I had a small trailer I could use, but didn't want to if I didn't have to. After all, the 95 horsepower engine had to work hard enough to get up the passes in the mountains of Washington as it was. The good news is we got everything we needed including water, food, tent, table, camp stove, sleeping bags, product to display, and backpacks in. It took a bit of grease on the door jambs, but it fit. 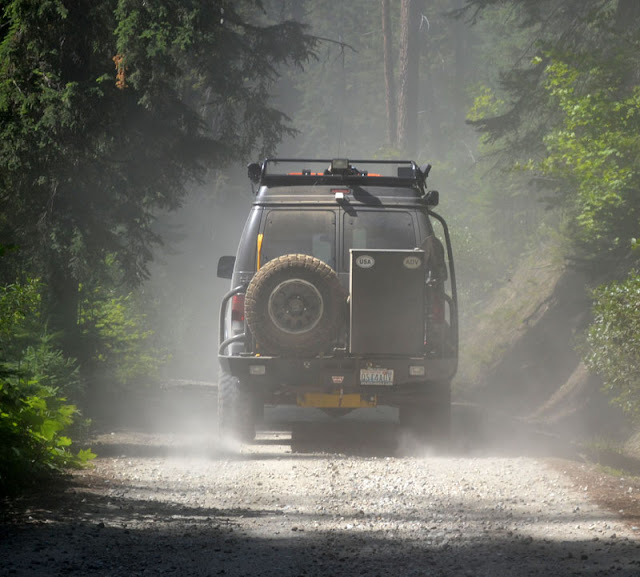 A Sportsmobile (4x4 van you can live in) ahead of us on the trail up to Trinity Mine. Our group explored the area via a few forest service roads while we were there. Nothing challenging for the vehicle, but these byways provided some amazingly scenic routes through the North Cascades. We also got the opportunity to visit the old Trinity Mine—a now abandoned copper mine started in the 1800s. (It should be noted that this is a private property, but the group had arranged a tour.) A caretaker lives there year round, even when it's under eight feet of snow. Because of this, Trinity is only accessible by dog sled or snowmobile during the winter. 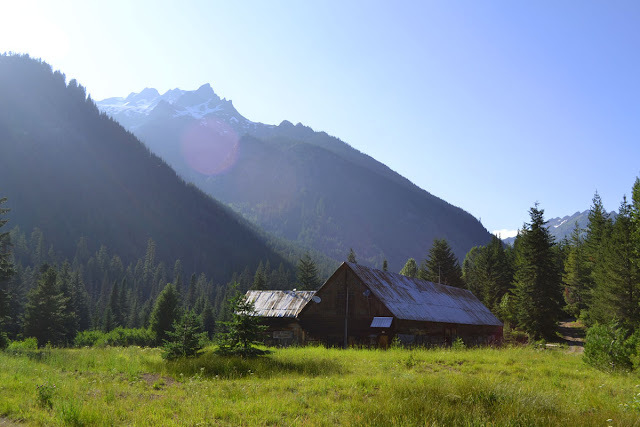 It also is 100% self sufficient power wise: It has a very old hydroelectric generator that provides power to the few buildings on site all year—and it's been running non-stop since the early 1900s. The old Trinity Mine Power House, which has a generator that's been in operation since the early 1900s. The area surrounding Trinity is breathtaking. It looks like Bavaria or Switzerland. I've long been fascinated by ghost towns and derelict sites, and this one was great. We had a tour provided to us, then it was back down the 25 mile trail to the main highway. Me driving through Washington on a hot July day. It almost goes without saying, but traveling in the Sidekick for 700 miles packed to the gills with no AC in 90-degree temperatures is a heart warming ...er ... body warming experience. It wasn't too bad, but we did notice a lot of heat came up from the footwells and firewall, which made for some hot jaunts, but with the windows down, we had plenty-o-breeze. Once we crossed the Columbia River into Oregon, things cooled off significantly, but we encountered what must've been a constant 30 MPH headwind, which tossed our Suzuki around quite a bit. The trucklet did great, event the slow 5,000 RPM, third-gear hikes up the passes. The only issue with the vehicle was a blown 15 amp fuse for the horn, and what I also found out is linked to the brake lights. The horn didn't work when we left for the event on Thursday, but I didn't think much of it. However, once we got home, I realized my brake lights had been out the whole time. Not cool. I thought some of the people behind me were coming up fast when I was stopped. Now I know why. 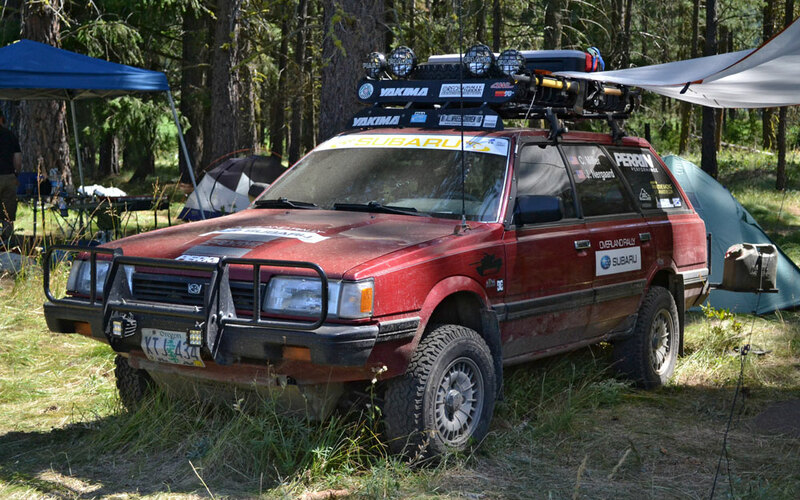 This lifted Subaru Loyale was likely the next smallest vehicle at the Rally. Very cool rig! While our Suzuki was by far the smallest rig at the event (the next smallest was the cool lifted Subaru Loyale above), we had a lot of people come up to us and say how they or a friend had a Suzuki Sidekick or Samurai and how they went everywhere, and were fun trucks. And although many of the other travelers had a rooftop tent or trailer to sleep in, our tent and a couple of Thermarests were fine. Hey, this is camping, right? In fact, I'd almost forgotten how great it can be to be outdoors for days on end. Cooking, relaxing, hiking, and sleeping outside can be a thing of beauty and a way to rejuvenate the soul. I know Mercedes and I both left feeling like we'd been changed a bit. One of the highlights of the rally was an amazing presentation by Tom and Janet of Adventurous Spirits, who've been on the road overlanding (aka traveling and living out of their vehicle) for years. It made us both think about what was really important in life and where our priorities lie. In addition, we met some amazing people, saw some sweet rigs, and learn some new stuff. It was great to get out there, disconnect for a while, and get back to nature. It makes one remember how nice it is to be away from it all, if only for a few days. It's something that my wife, my car, and I need to do more often. 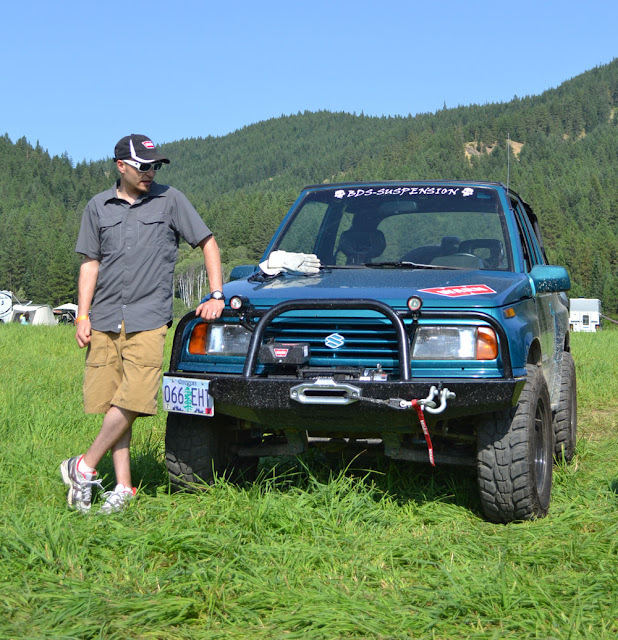 Me teaching an introductory winching class with my Suzuki and WARN VR8000-s winch. I saw the Terror covered in mud upon its return. It was a thing of beauty. Nice. 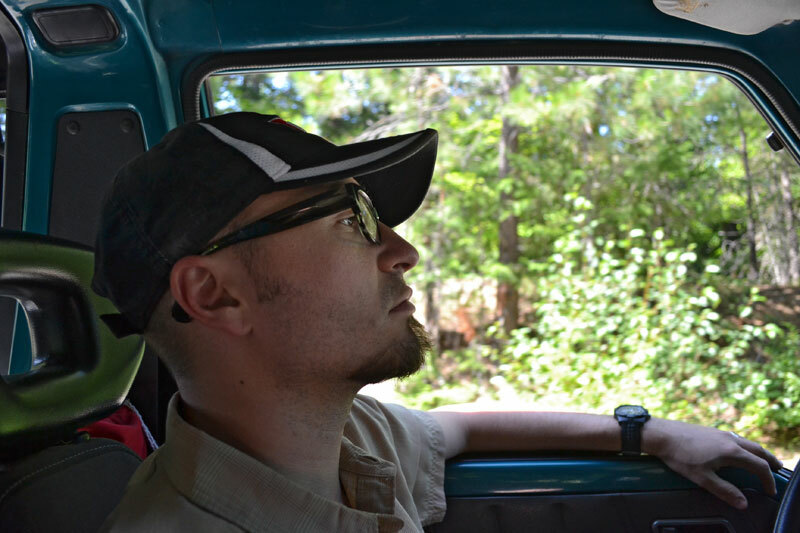 I've gone camping in a swb Sidekick. Packing is a bit like Tetris huh? Looks like a fun trip.